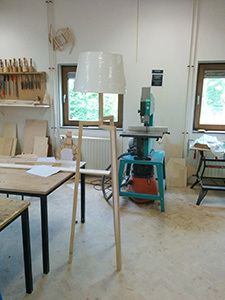 I build this lamp during a wood workshop, inspired by a lamp I saw at a Dutch chain called "De Bijenkorf". 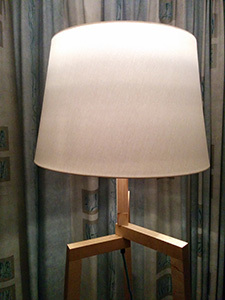 The lamp being quite pricey, I decided to combine the pleasure of doing a wood working course and making something useful. The article is not completely done yet as I will try to add a few more pictures to illustrate some details. 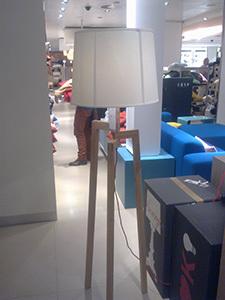 The idea is to have a lamp on three legs, and the cable going through the center. This is a short article just to show the basics to inspire you, using a lot of images to try to make it as clear as possible. This article is written in one go, following the train of thought. Please also think before you make any permanent changes . Note: Give glue plenty of time to dry - preferably a day. Step 1) First you create three legs. In my case I had to put two pieces of wood together to get the required thickness. Of course, you can make your own changes as you see fit. 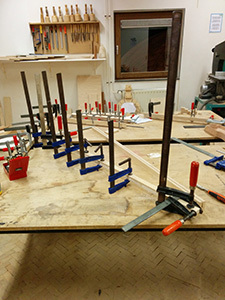 The wood used in my variation is multiplex with a thickness of 14-15mm. These were combined to give a thickness of 28mm or 30mm (so in total 6 legs had to be sawed). The pieces should be glued together and held firmly with glue clamps (put clamps on both sides of the wood, to make sure it does not slide!). The width of the legs is 30mm. the length is different for the three legs. The legs should be cut in such a way, that hadding the horizontal part (which is 30mm) will just fit under the leg above! See the (concept) image below for more clarity. Now, we need to add an angle to the leg. 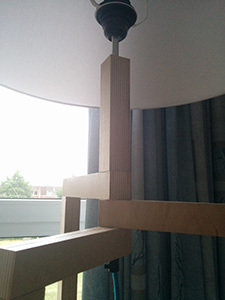 The angle in my lamp is 5 degrees. 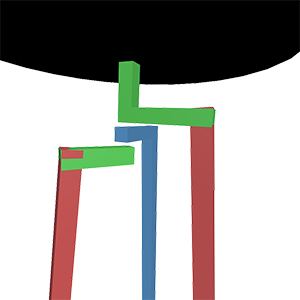 You need remove 5 degrees from the legs at the bottom, and the opposte way from the top. 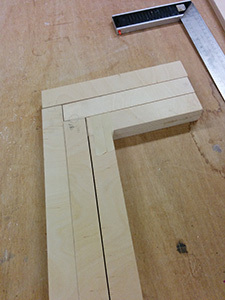 Doing it the other way at the top will counter the angle of the leg, thus making the horizontal part straight again! Please take care in doing this. 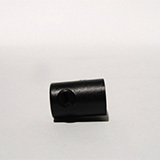 You will also need to remove 5 degrees (or whatever value you chose) from one of the horizontal parts of the legs. this will make sure that the line of the entire leg is nicely angled as a whole. Otherwise it will end in a straight block. Step 2) Drill the holes in each horizontal part of the leg, such that all legs would fit together. Make sure you do this right. 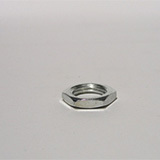 The holes should be 10 mm, if you use a different size screw thread change this accordingly. Sand everything such that everything is nice and smooth . You might also have to make a roll out of sanding paper to sand the interior of the holes a bit. Step 3) Glue the horizontal parts together. 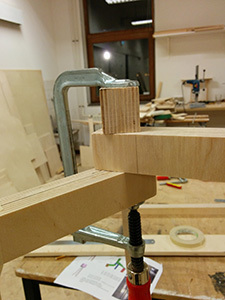 Because of the angle you cannot use a glue clamp on the wide side (but you can for the small side). So hold it firmly together with your hands for 15-20 minutes. Do this for every leg. 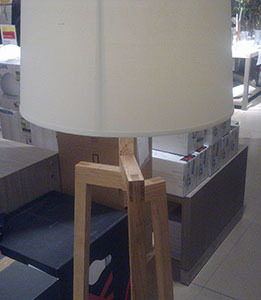 Step 4) Make the vertical part of the lamp, which sits on top of the tallest leg. This should be same width and thickness. Height can be changed to your liking. 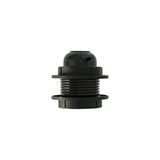 But - you will also have to drill a hole through it as well. So make sure your drill is long enough. Afterwards you will need to sand the interior of the hole, again with a piece of sanding paper which has been rolled up. 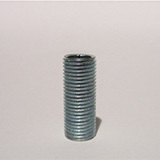 Otherwise the the screw thread will be very difficult to get through all the pieces of wood. Step 5) All parts done! 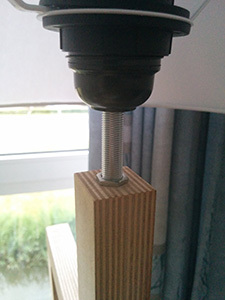 Now you need to have the parts that make your lamp really a lamp: Lampholder, screw thread, electrical wire, bolt for the screw thread (on top), an terminator at the exit point at the bottom leg (see images) and obviously a lamp. Put these together as seen on the picture. (this is a bit short, but it should be fairly obvious. 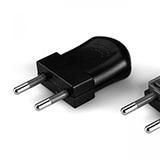 Do not forget to connect the wire to the lamp holder though! ). 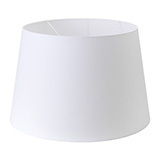 Make sure you cut the screw thread in the center of the light to make it fit - but not too short that your lamp holder cannot fit anymore! 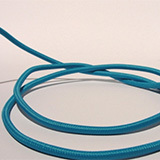 Step 6) Assemble the plug to the cable, put on the lamp hood and double check if you did not make any mistakes. 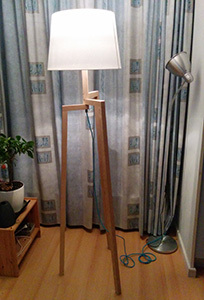 Put the plug in the wall socket, and you should have a finished lamp! Step 7) Add some kind of varnish to the lamp to make sure the wood keeps it color. Hope this instruction inspires you to make a nice lamp. The great thing is that it is very easy to adapt to your own liking. It looks great. Looking forward to see some pictures! ** Photos taken from "Snoer & Zo"